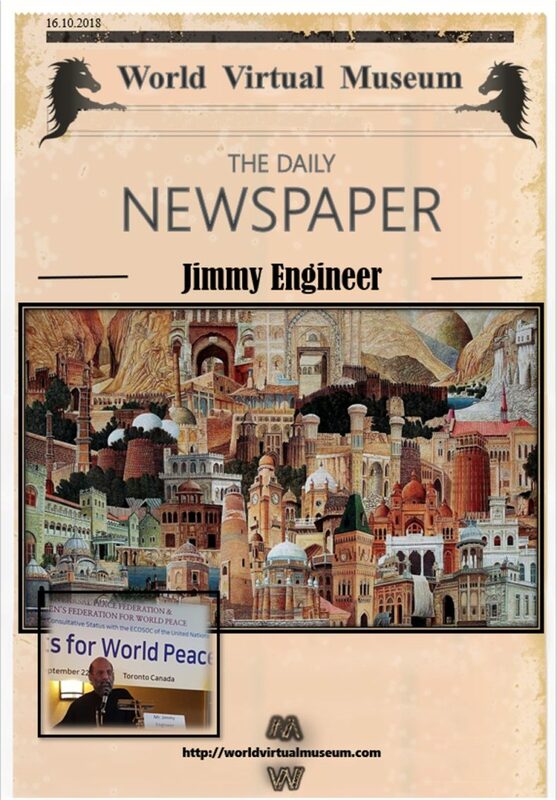 Jimmy Engineer Artist and Social Worker was born on 13th August 1954 in Balochistan, Pakistan. His Parsi family could not have known then that he would grow up to break all barriers of caste and creed and truly define multy -ethnicity through his art and altruism.. It was in 1976 that he turned into a professional painter but his achievements went much beyond his artist’s creativity when he discovered a deep love for all his fellow beings, specially for the downtrodden. His art pieces soon became expressions of truth and his images began to speak of his compassion for the people he saw. Although an artist by profession, Jimmy Engineer’s life has revolved around supporting troubled individuals as well as social work institutions, though he himself prefers to remain undocumented and unsung. 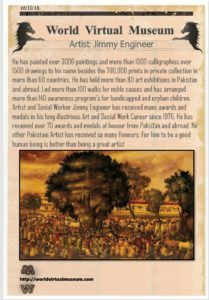 His works have never failed to captivate successive generations of art lovers in Pakistan and abroad. 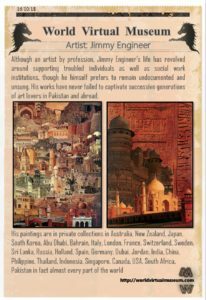 His paintings are in private collections in Australia, New Zealand, Japan, South Korea, Abu Dhabi, Bahrain, Italy, London, France, Switzerland, Sweden, Sri Lanka, Russia, Holland, Spain, Germany, Dubai, Jordan, India, China, Philippine, Thailand, Indonesia, Singapore, Canada, USA, South Africa, Pakistan in fact almost every part of the world. 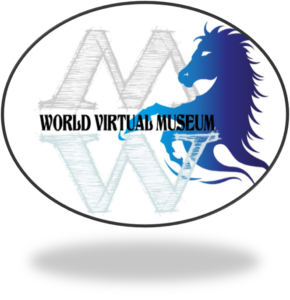 He has painted over 3000 paintings and more than 1000 calligraphies over 1500 drawings to his name besides the 700,000 prints in private collection in more than 60 countries. 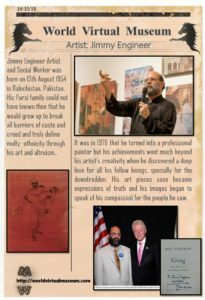 He has held more than 80 art exhibitions in Pakistan and abroad. Led more than 100 walks for noble causes and has arranged more than 140 awareness program’s for handicapped and orphan children. Artist and Social Worker Jimmy Engineer has received many awards and medals in his long illustrious Art and Social Work Career since 1976. He has received over 70 awards and medals of honour from Pakistan and abroad. No other Pakistani Artist has received so many Honours. For him to be a good human being is better than being a great artist. 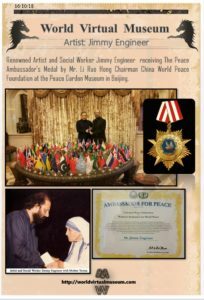 Renowned Artist and Social Worker Jimmy Engineer receiving The Peace Ambassador’s Medal by Mr. Li Ruo Hong Chairman China World Peace Foundation at the Peace Garden Museum in Beijing.